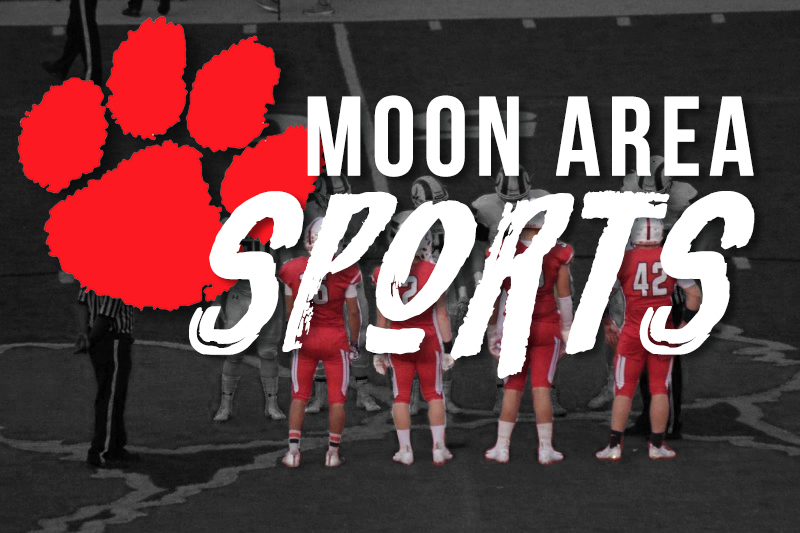 MOON TOWNSHIP — The Chartiers Valley Colts (15-3, 9-2) hit the road to take on the Moon Area Tigers (16-1, 6-1). The entire game felt like a playoff atmosphere as the fans were screaming, the players were fired up and even the rafters were shaking. Moon came out at tip-off with a scoring tangent. They went on a 7-0 scoring run, in which Donovan Johnson scored five. Chartiers Valley hit a pair of free throws to break the run. Midway through the first, Chartiers Valley went on a run of their own. The Colts went on a 7-0 run as well thanks to good defense and transition basketball. Connor Ryan broke up the run with a heavily contested layup. To close out a heated first quarter, the Colts converted an and-1 to put them up one. The Colts came out of the first on top, 17-16. The second quarter started off with a top of the key three-pointer for the Colts to extend their lead. Moon answered the three with a 7-0 run to put them ahead of the Colts. On the run, Johnson hit a corner three along with a couple free throws supplemented by Connor Ryan who also drained a couple of foul shots. After a debatable call by the referees against Moon, Johnson stole the ball and slammed it on the other end with authority. Chartiers Valley closed out the quarter with a layup, but it was not enough to take the lead as Moon ended the half up, 25-24. The third quarter began with a great shooting performance from the Colts. They hit two threes back-to-back which forced Moon to take a timeout to regroup. After the timeout Moon answered with layups from both Connor Ryan and Taru Jones. The Colts were not done with the three-pointers. The Colts hit two more in three possessions and added another before the quarter was over. The Tigers did everything they could to bring the game within reach before halftime. An and-1 conversion from Jioni Smith and a couple of free throws from Connor Ryan helped in that effort. At the end of the third quarter, the Colts were up, 43-40, on the Tigers. To begin the fourth quarter, the Colts drew a shooting foul where they nailed both shots from the stripe. Moon answered Chartiers Valley yet again, with layups from both Connor Ryan and Johnson which also started a 6-0 run for the Tigers. After the two teams went back and forth for a few minutes, the Colts found themselves up by three with 30 seconds left. Moon had the final possession of the fourth quarter. After Moon inbounded the ball, following the free throws from the Colts, Austin Ryan found himself coming off a screen at the top of the key. Ryan raised up over a Colts defender and drained the three to tie it up with 24 seconds left. The Colts, soon after, rushed down the court and forced up a shot and missed. With three seconds left in the quarter, Austin Ryan fired up a 40-foot prayer which missed wide left to send the game into overtime. The first overtime was a defensive slug fest. Both teams combined for 4 total points. Chartiers Valley made a pair of free throws and Connor Ryan made a layup. The Colts fired up a full court shot with one second left in hopes of winning the game but the ball was ten feet short. Both teams would have to fight through another four minutes of overtime. Double overtime was a free throw filled four minutes. 14 free throws were shot between both teams. To begin the second overtime, the Colts made three free throws to give themselves the lead. After a bit of a back and forth exchanging fouls and free throws the Tigers found themselves down three with 37 seconds left. On an inbound play from the Colts, Ryan stole the ball and immediately put the ball up to cut the lead to one. On the next possession the Tigers were called for a foul after some intense defense from all five players on the court. The Colts hit both free throws and put themselves up by three. Moon gained possession and got into their offense to find the easy score. Jioni Smith saw a gap in the defense and exploded to the rim which drew the foul and nearly missed an and-1 opportunity. Smith found himself at the line, down by three with 20 seconds left. Smith did not make a single free throw and the Colts scored a wide-open layup off the miss to extend their lead to five. With seven seconds left in the game, the Tigers needed a miracle to pull out a win. After a pass in bounds, Johnson got the ball in the quarter and drained a three over two Colts players to bring themselves within two with three seconds left. However, all Moon’s chance of winning faded after the Colts made a single free throw to go up by three with a second left. The Tigers had no timeouts and had to inbound from the opposite side of the court. Connor Ryan shot up a prayer in hopes to tie the game, but the shot was wide left and the Colts came out victorious, 69-66. This was Moon’s first loss of the season and ended their reign as being the only undefeated team left in the WPIAL. In their next match-up the Tigers will travel to play Lincoln Park Charter School (16-2, 10-1) in a non-conference game this Saturday.